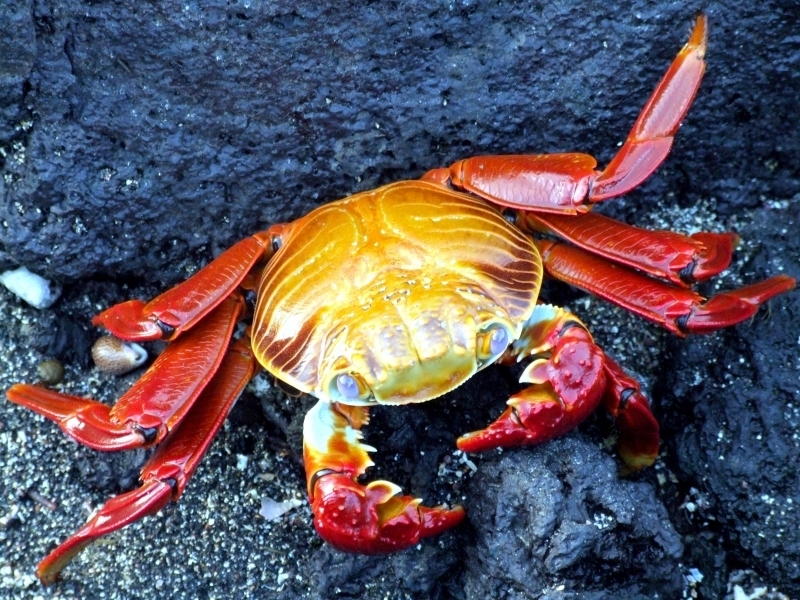 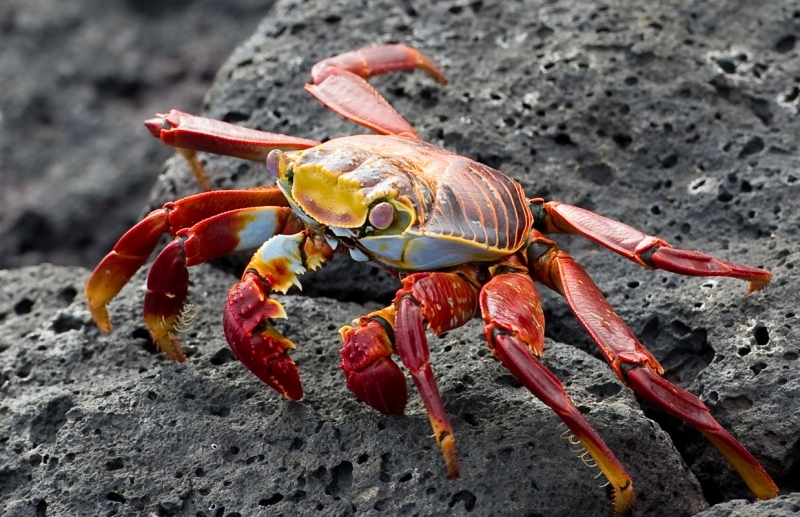 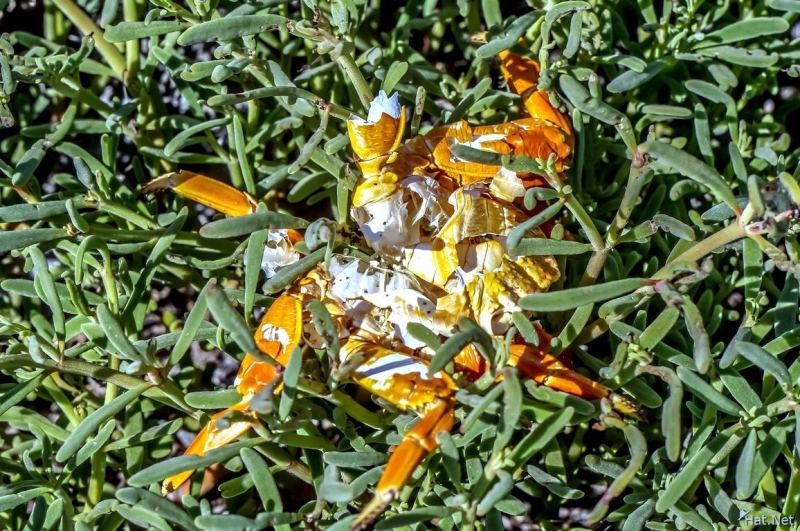 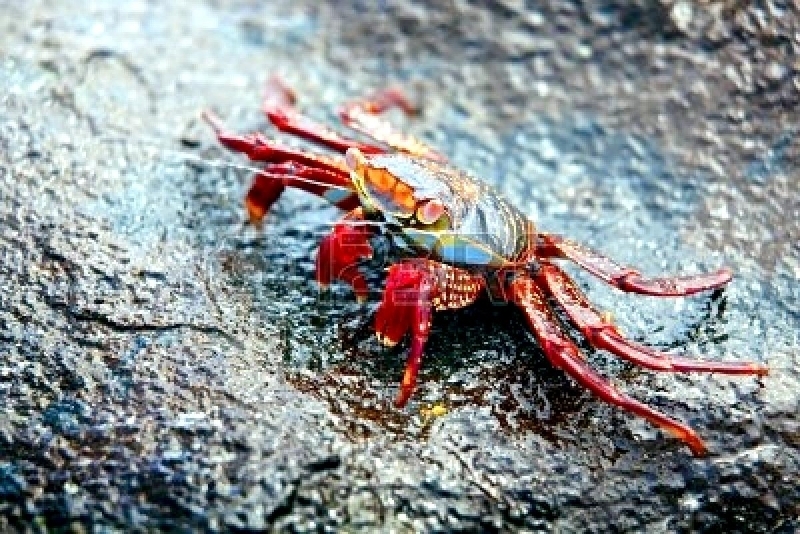 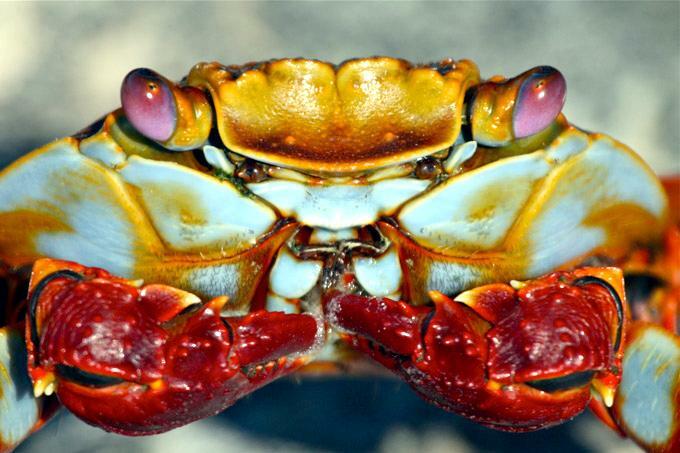 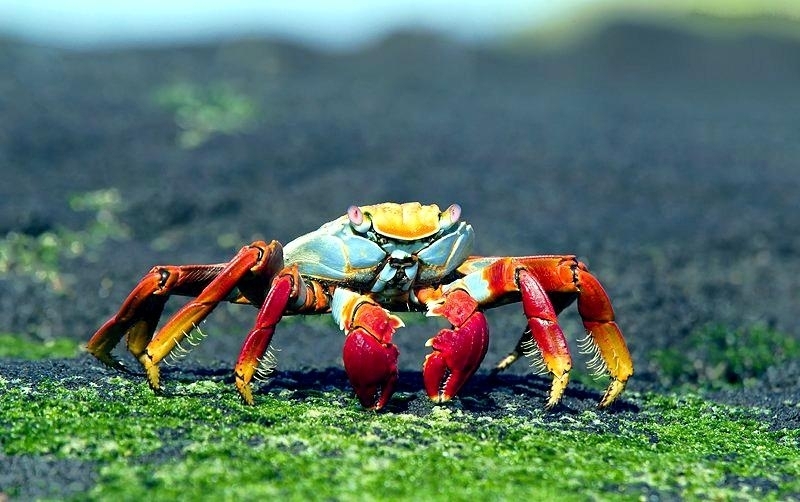 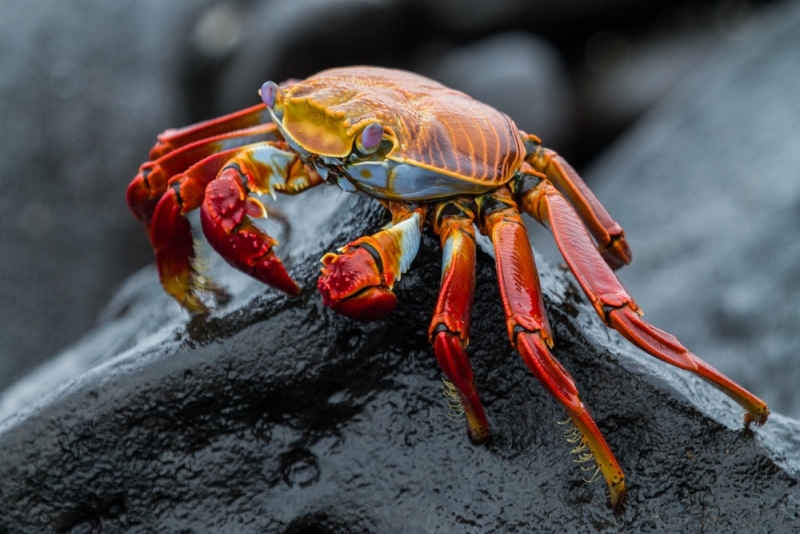 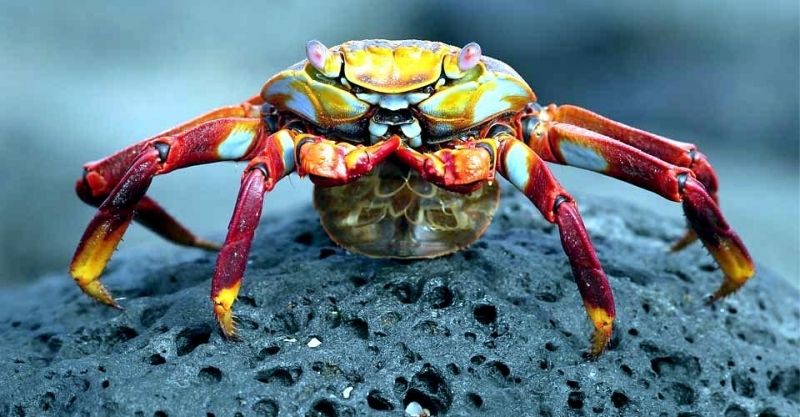 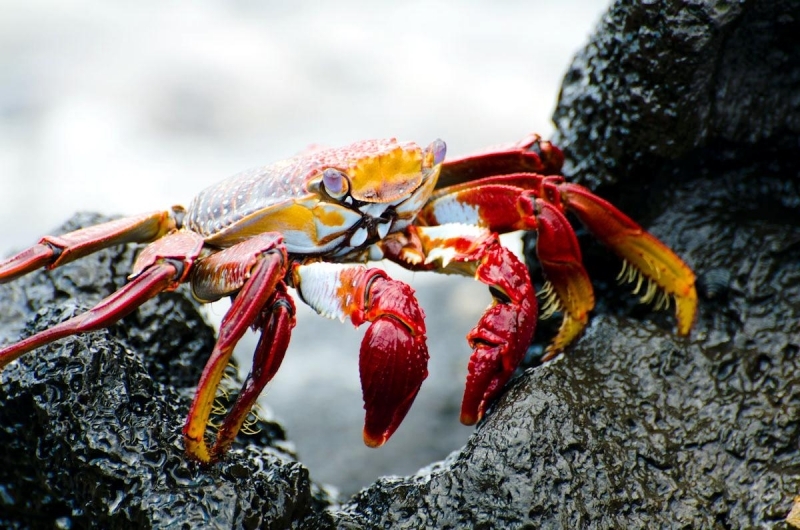 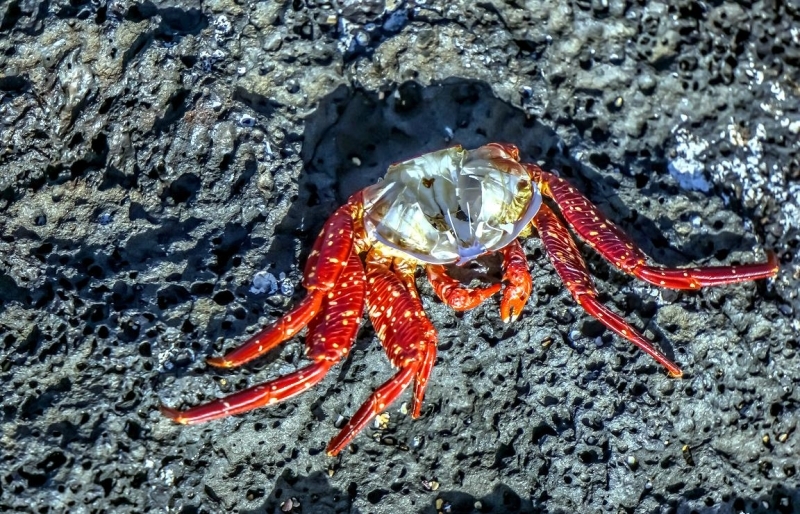 The Sally Lightfoot Crab are brightly colored scavengers of the coast. 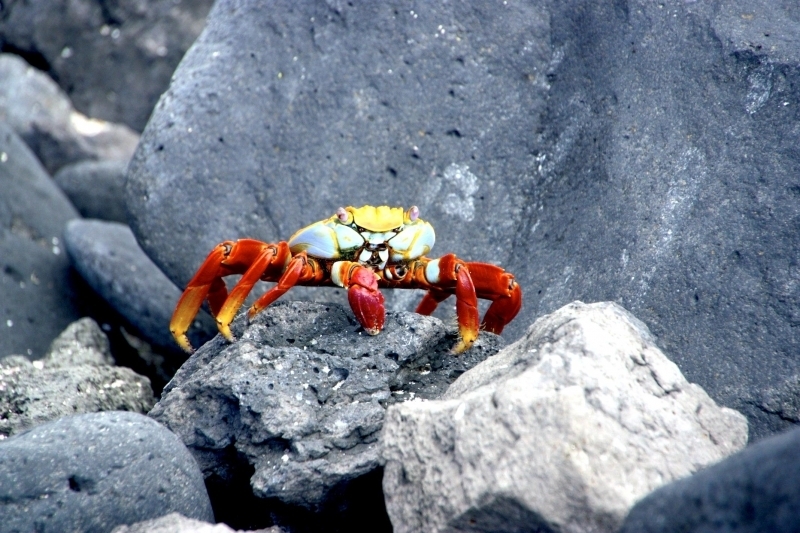 The common name is thought to have originated from a Caribbean dancer and refers to their inherent agility, jumping from rock to rock and climbing up vertical terrain. 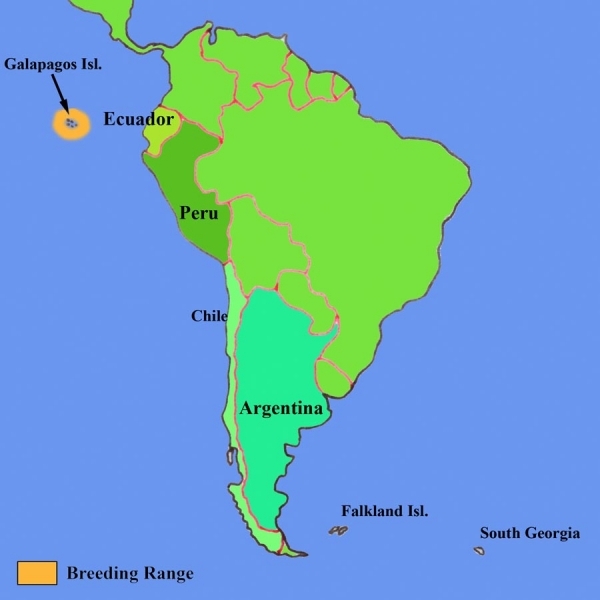 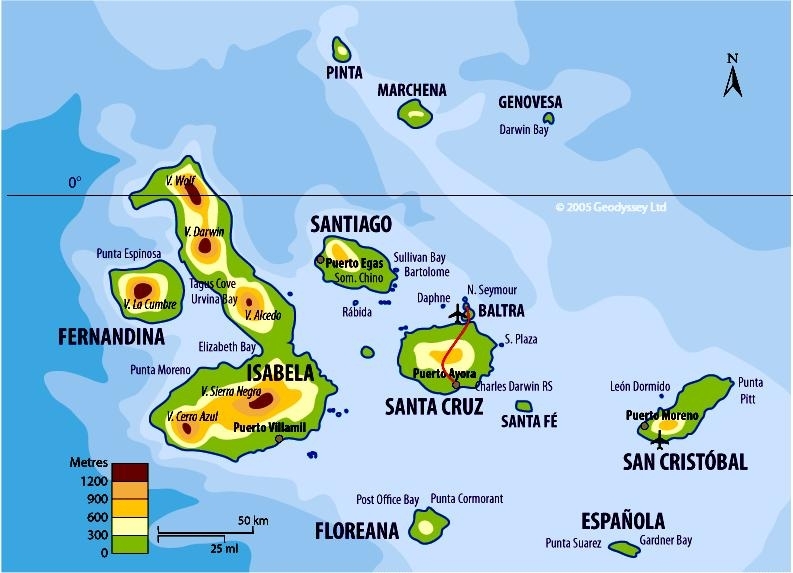 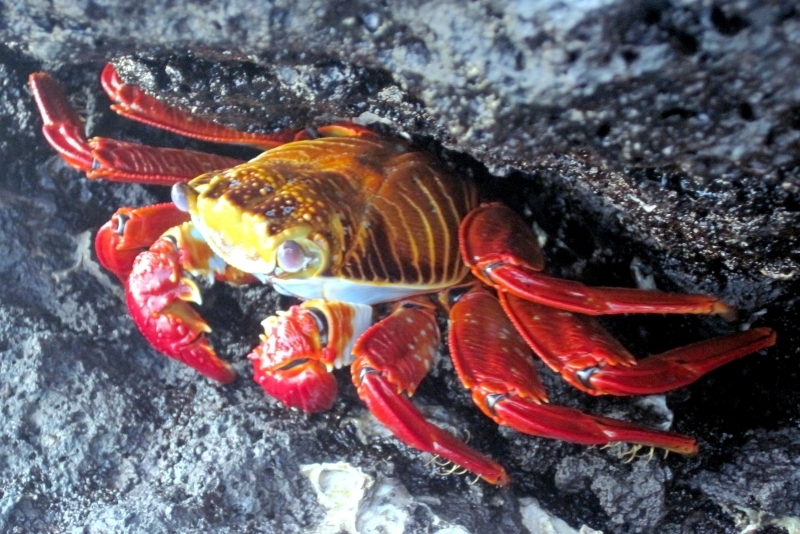 The Sally Lightfoot Crab was collected by Charles Darwin during his voyages on HMS Beagle and also by the first comprehensive study of the fauna of the Gulf of California carried out by Ed Ricketts. 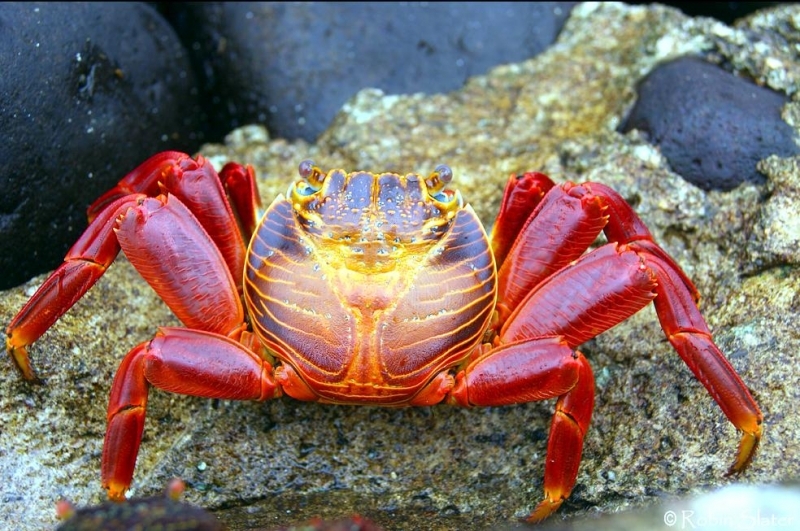 Many people have spoken at length of the Sally Lightfoots. 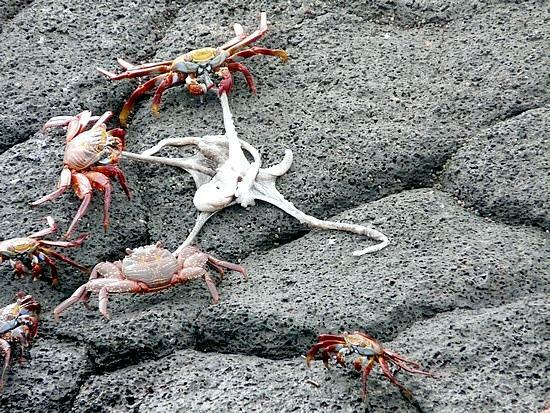 In fact, everyone who has seen them has been delighted with them. 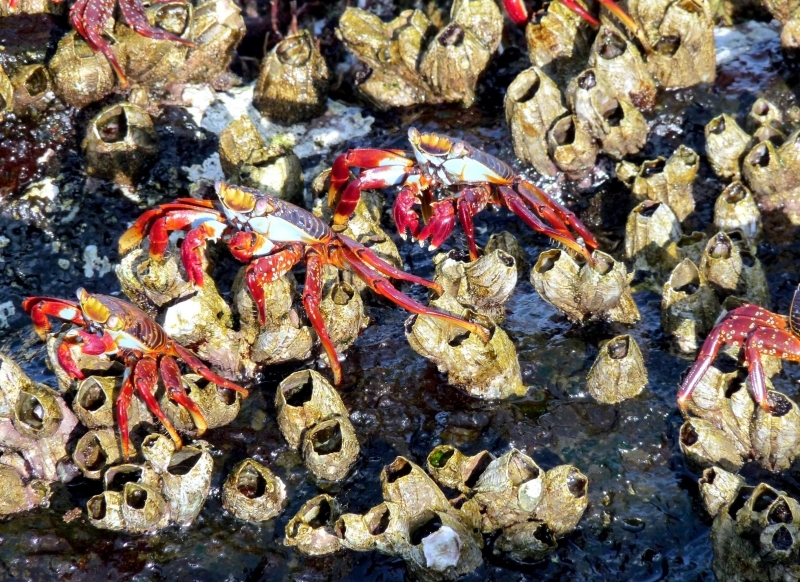 The very name they are called by reflects the delight of the name. 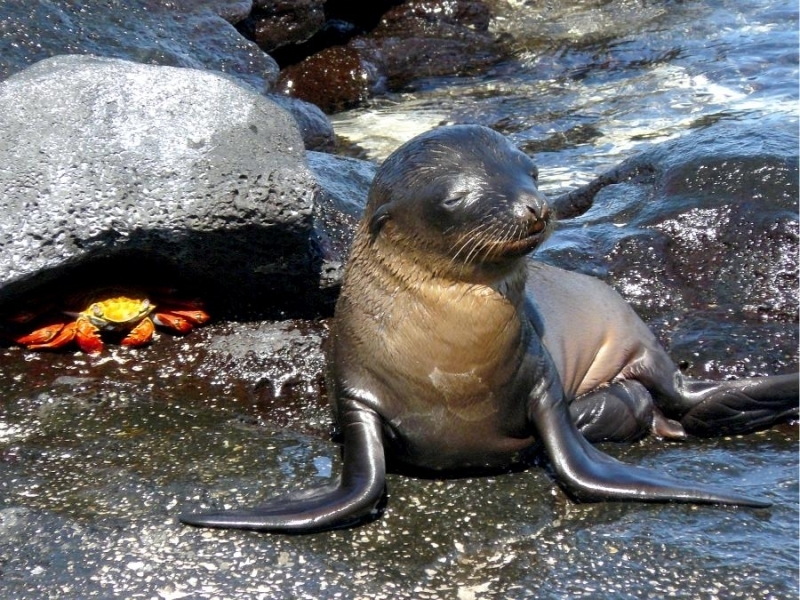 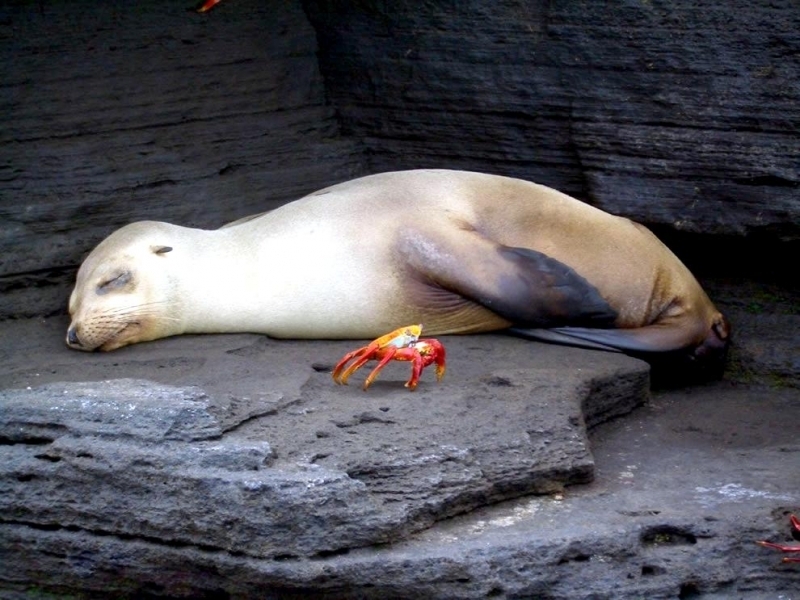 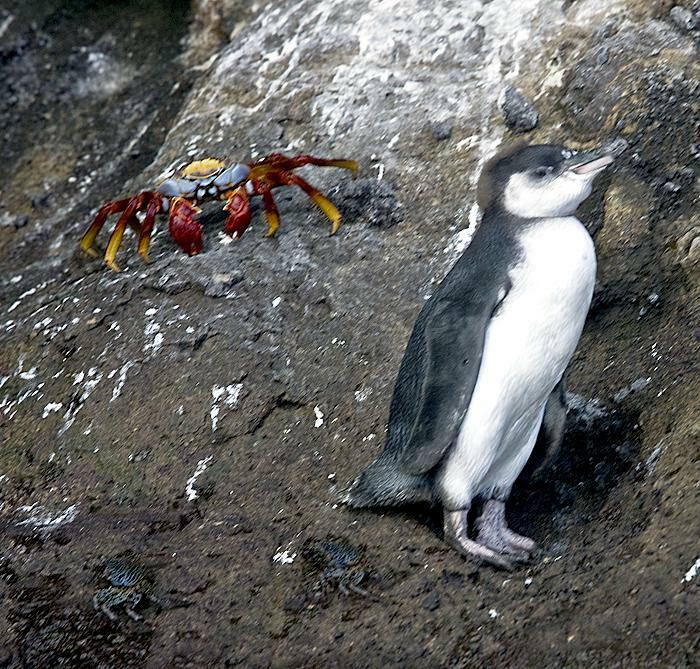 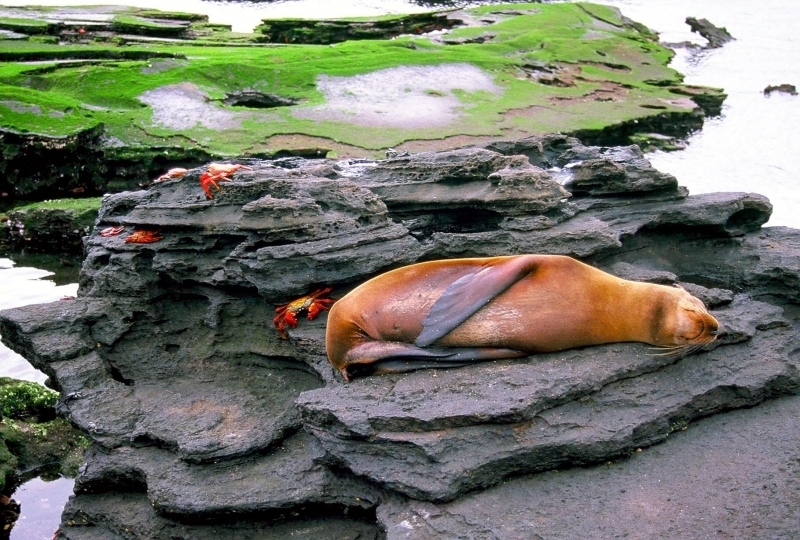 They will basically feast on anything they can get their claws on, from pinniped placenta to other crustacean including their own kind. 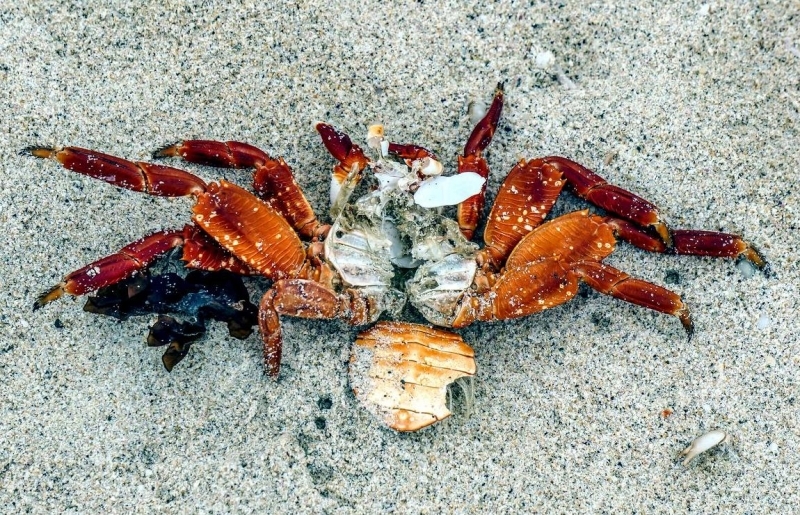 The Sally Lightfoot Crab is a typically shaped crab with 5 pairs of legs, the front 2 bearing small, blocky, symmetrical chelae. 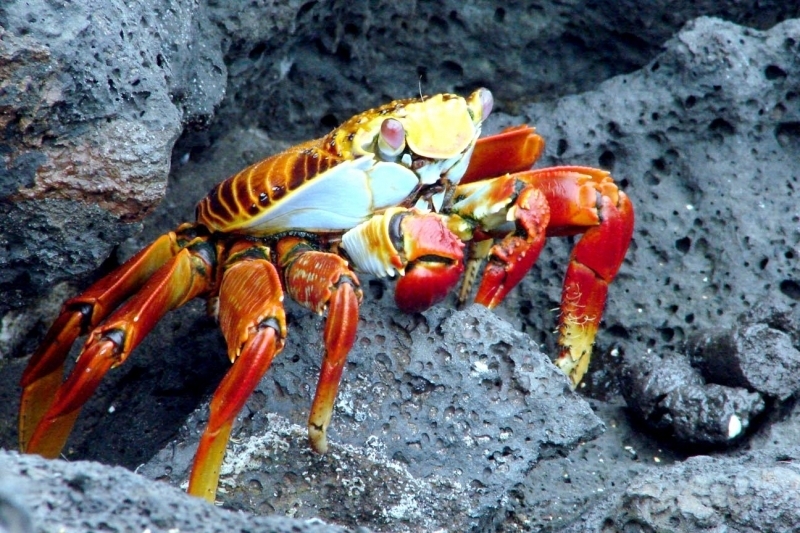 The other legs are broad and flat with only the tips touching the substrate. 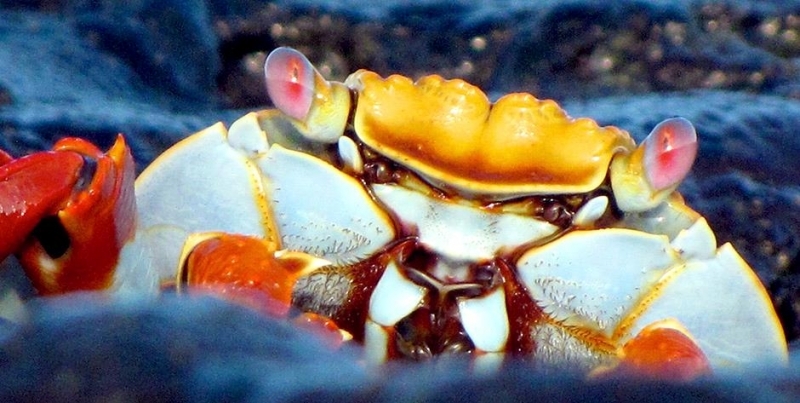 The crab’s round, flat carapace is just over 3.1 inches in length. 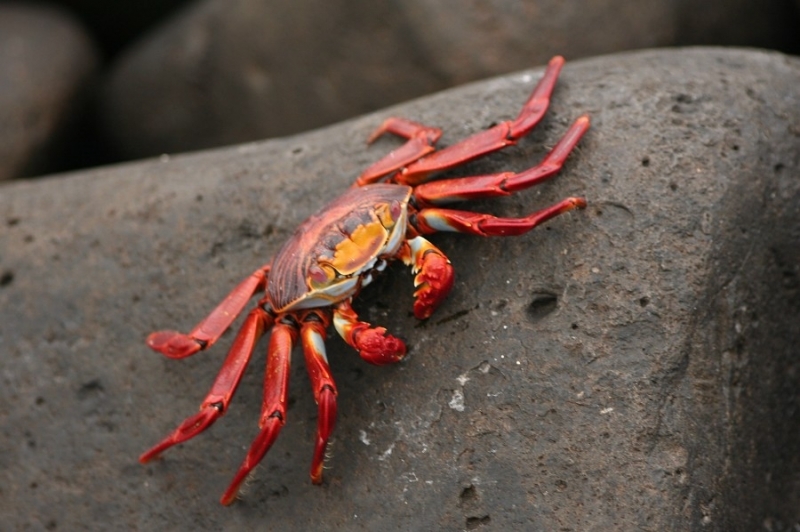 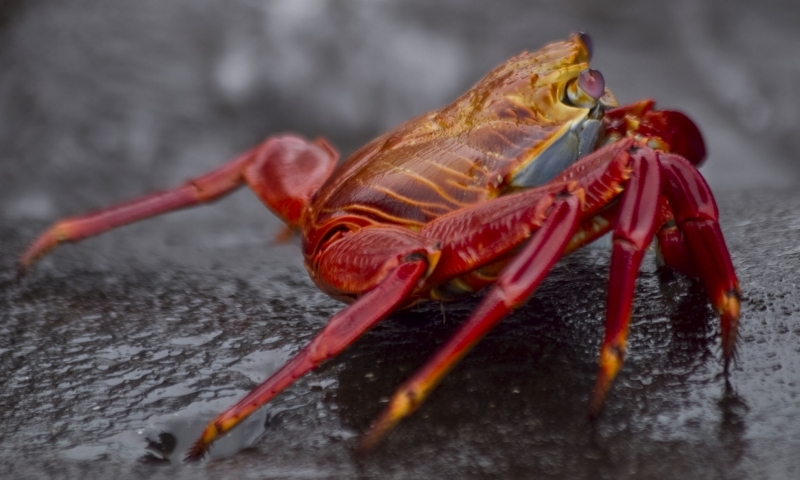 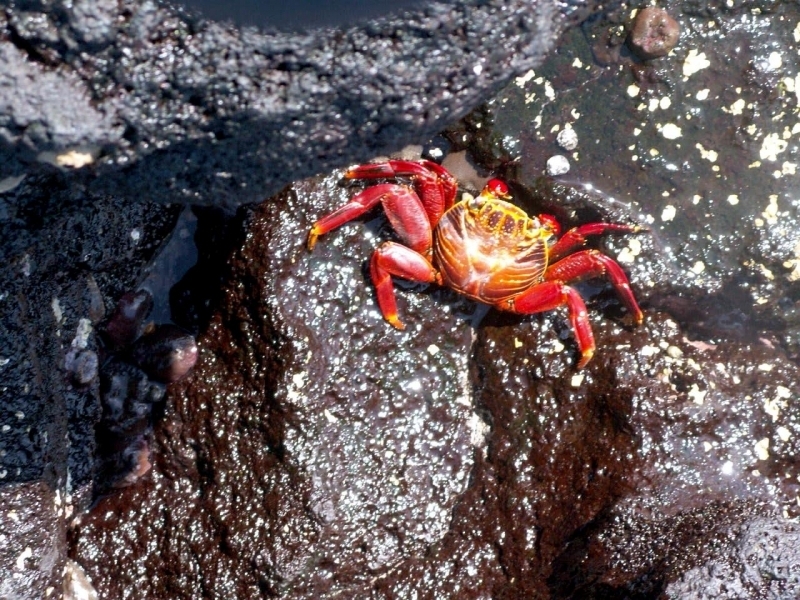 The Sally Lightfoot Crab lives among the rocks at the often turbulent, windy shore just above the limit of the sea spray. 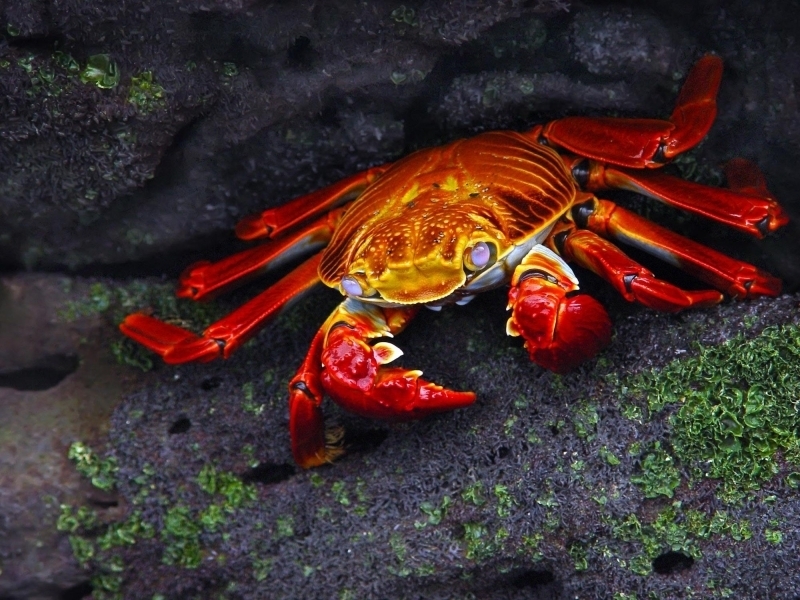 It feeds on algae primarily, sometimes sampling plant matter & dead animals. 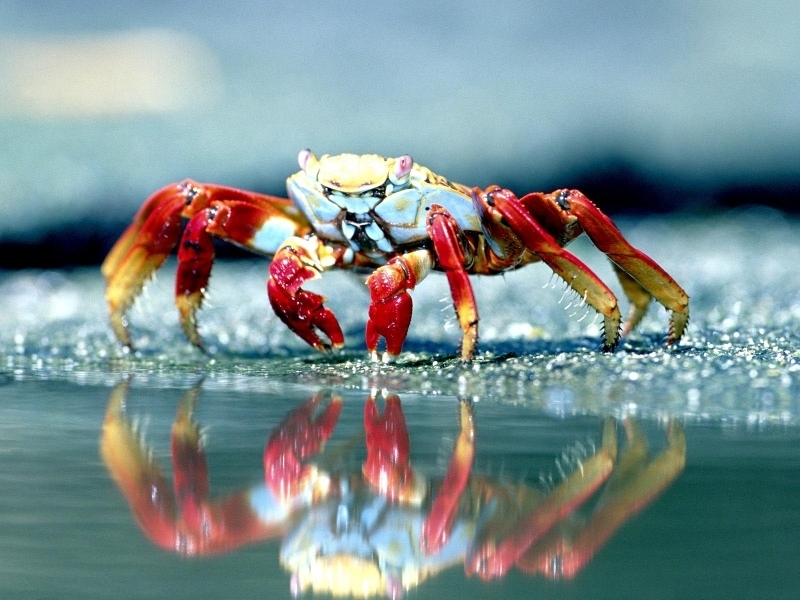 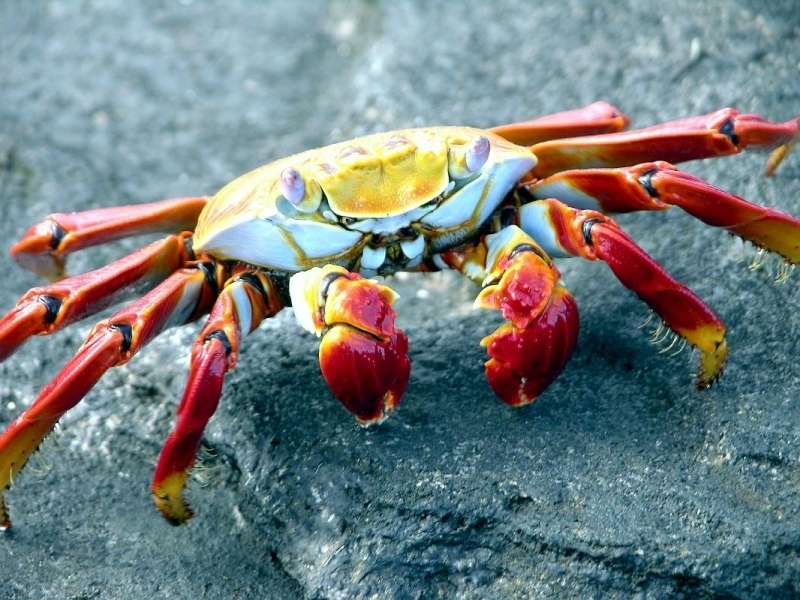 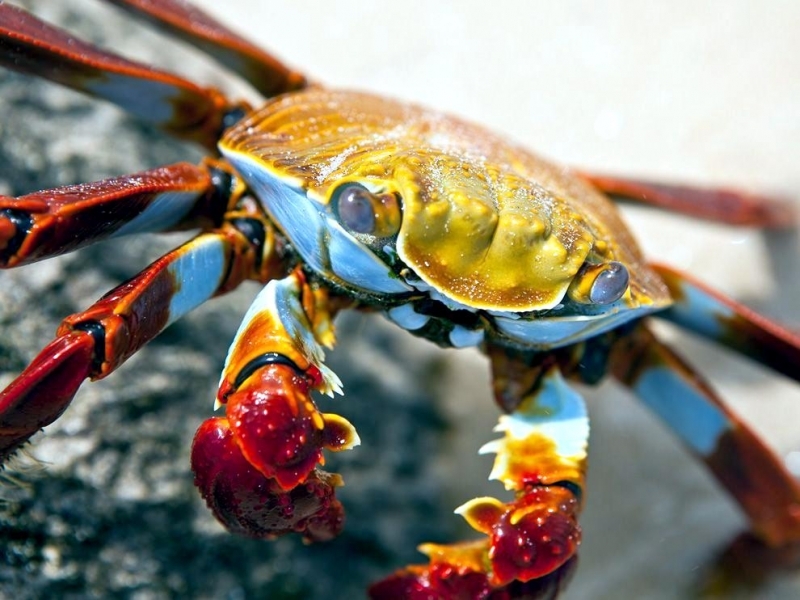 It is a quick-moving & agile crab and hard to catch but not considered very edible by humans. 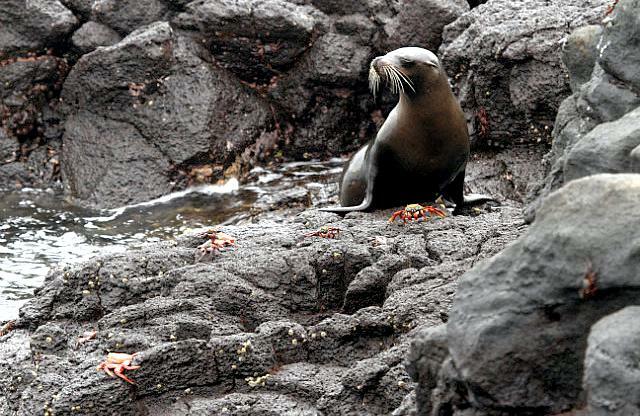 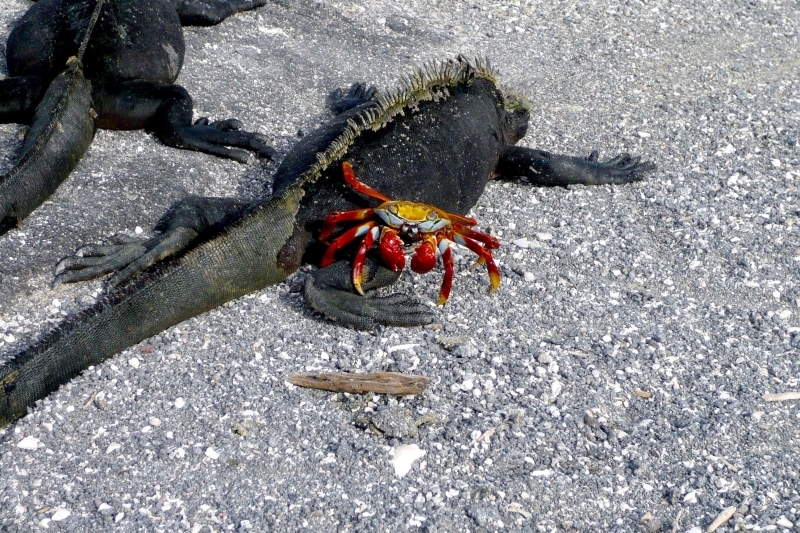 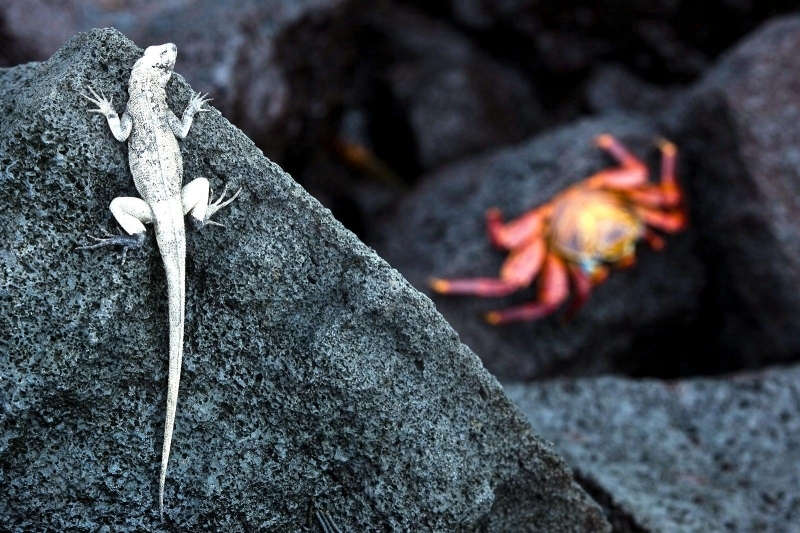 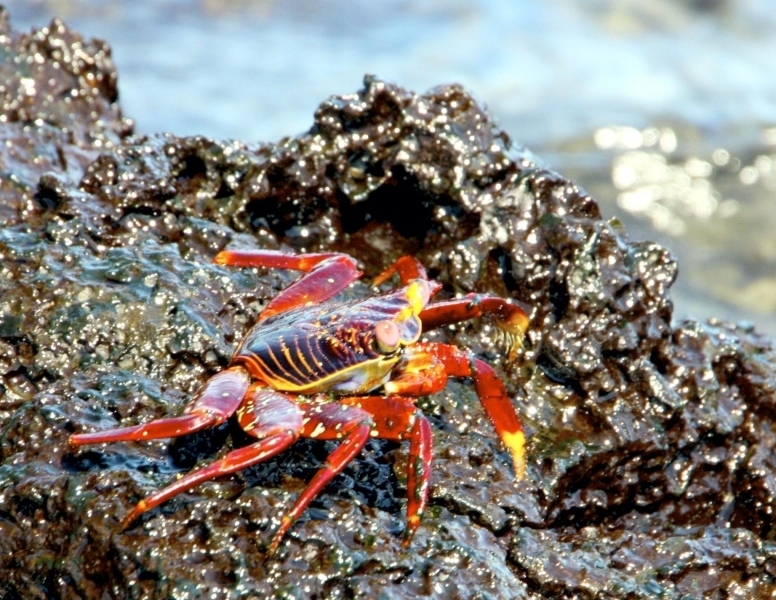 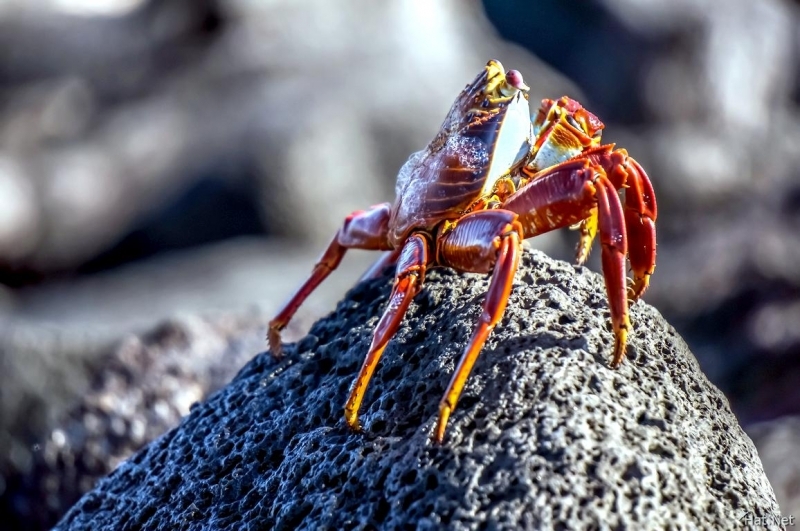 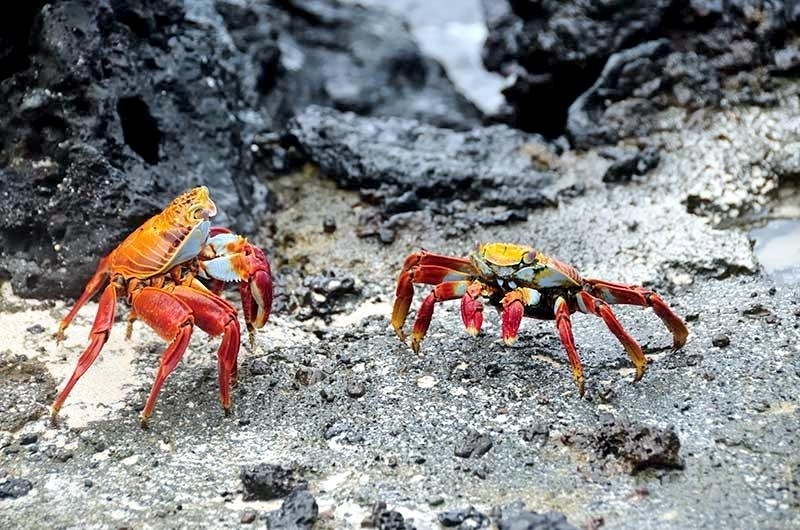 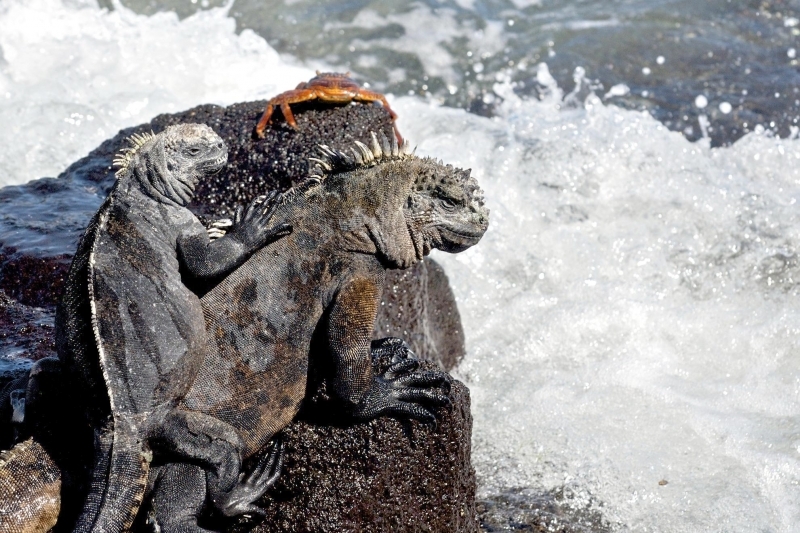 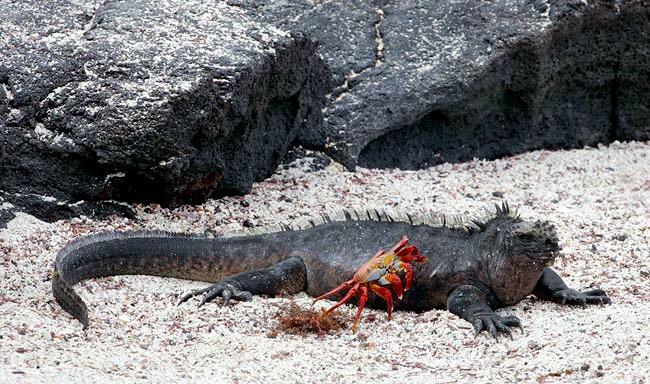 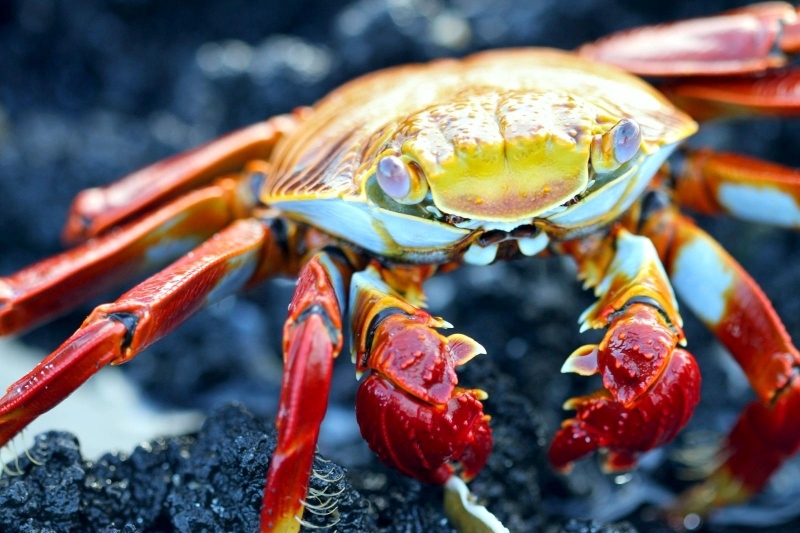 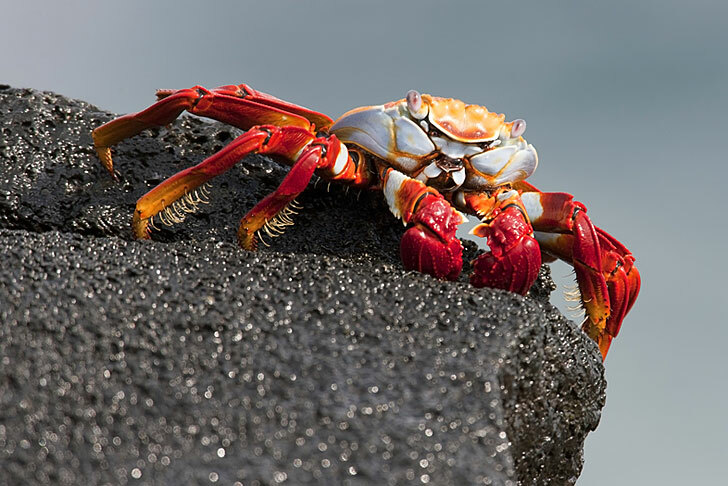 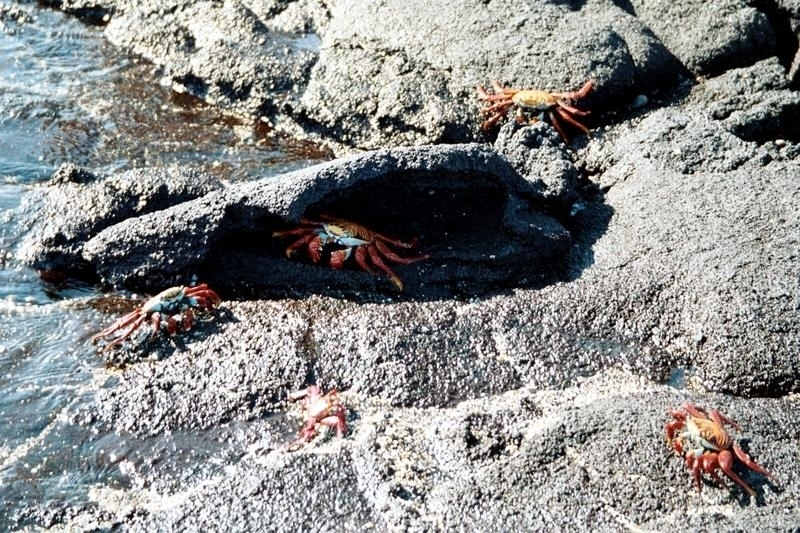 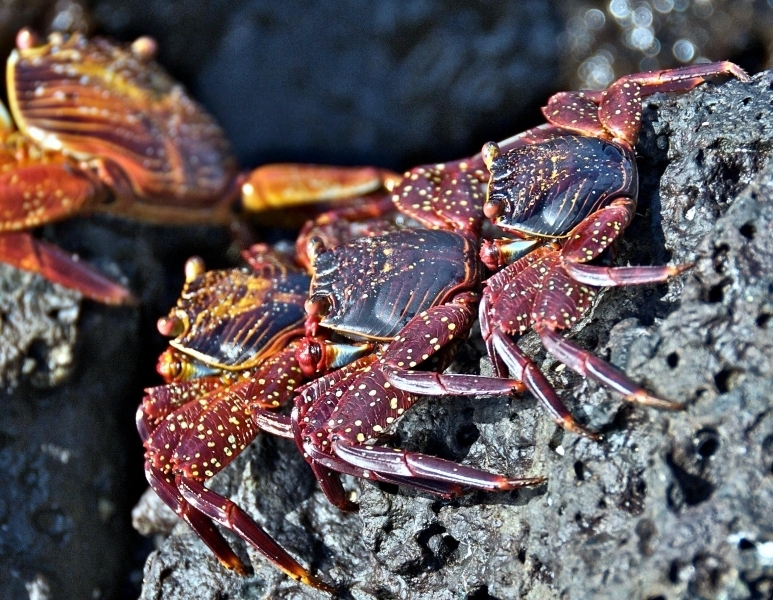 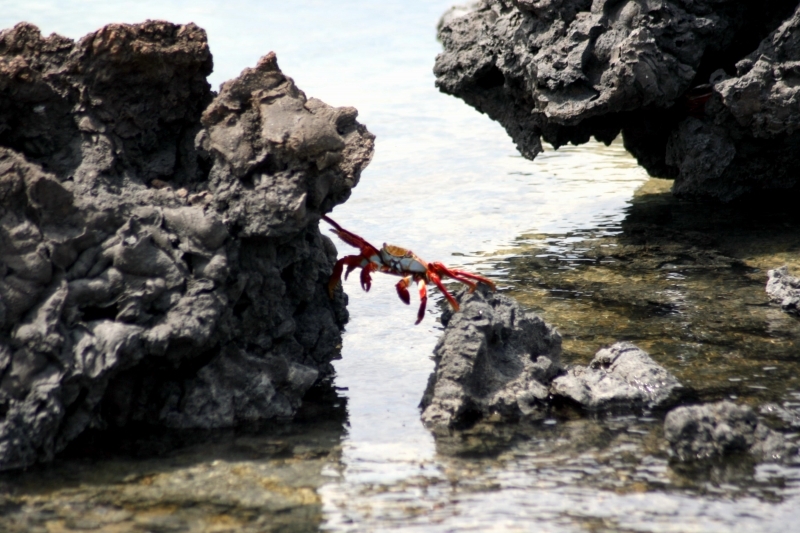 Sally Lightfoot Crabs are black or dark brown in color and camouflage well on the black lava coasts of volcanic islands. 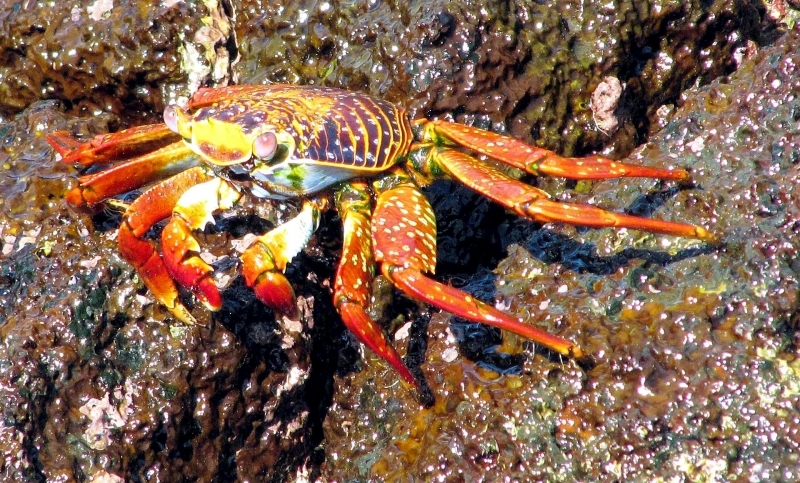 Adults are quite variable in color. 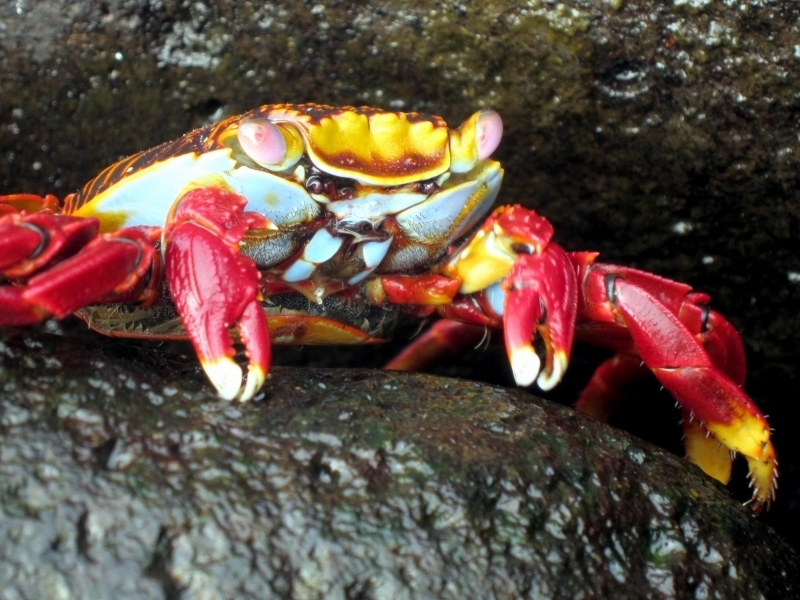 Some are muted brownish-red, some mottled or spotted brown, pink or yellow. 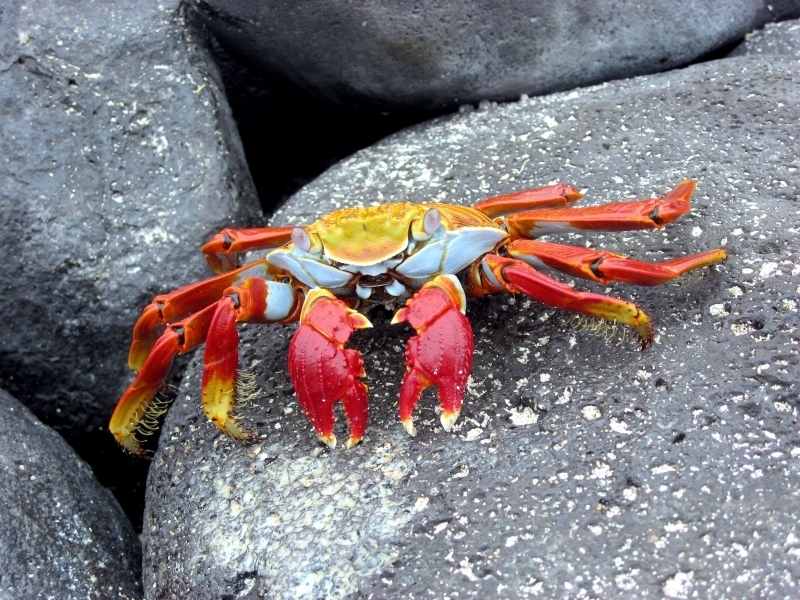 The ones seen on photographs of tropical island fauna are often bright orange or red with stripes or spots dorsally, blue & green ventrally and sporting red claws and pink or blue eyes. 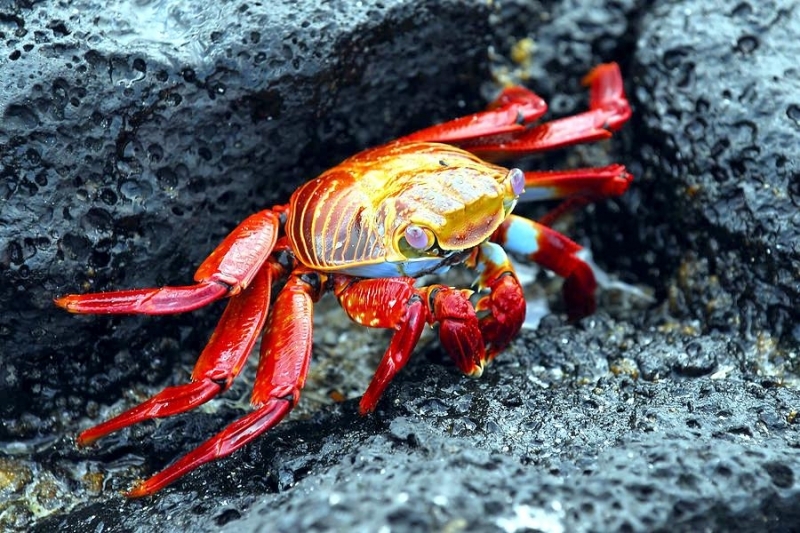 Sally Lightfoot Crabs with brilliant cloisonné carapaces, walk on their tiptoes. 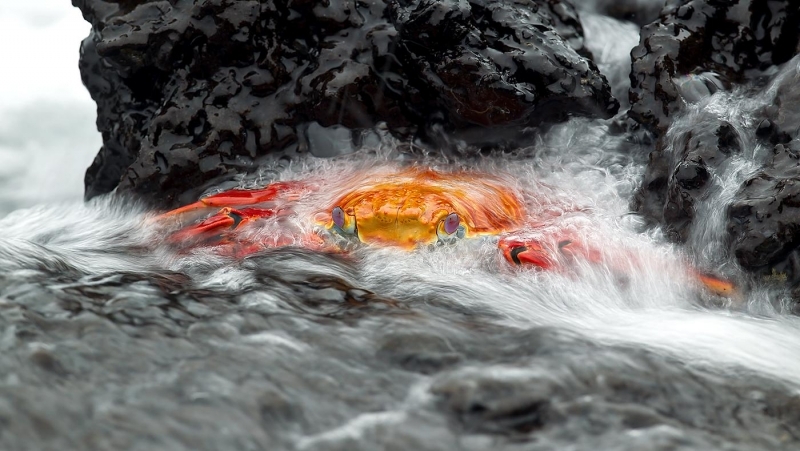 They have remarkable eyes and an extremely fast reaction time. 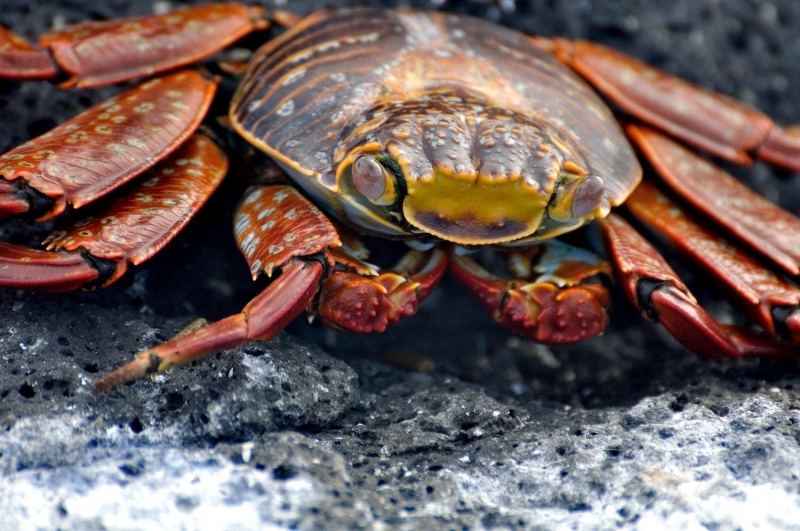 They seem to be able to run in any of 4 directions; but more than this perhaps because of their rapid reaction time, they appear to read the mind of their hunter. 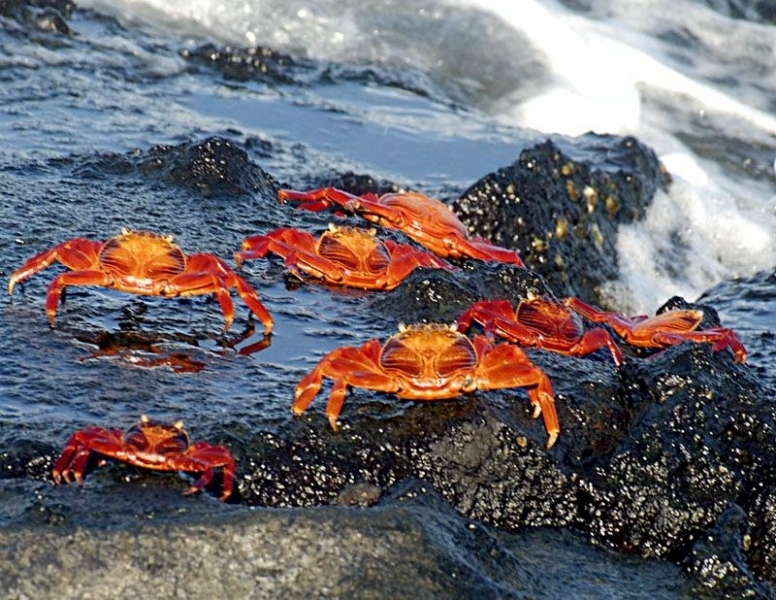 They escape the long-handled net, anticipating from what direction it is coming. 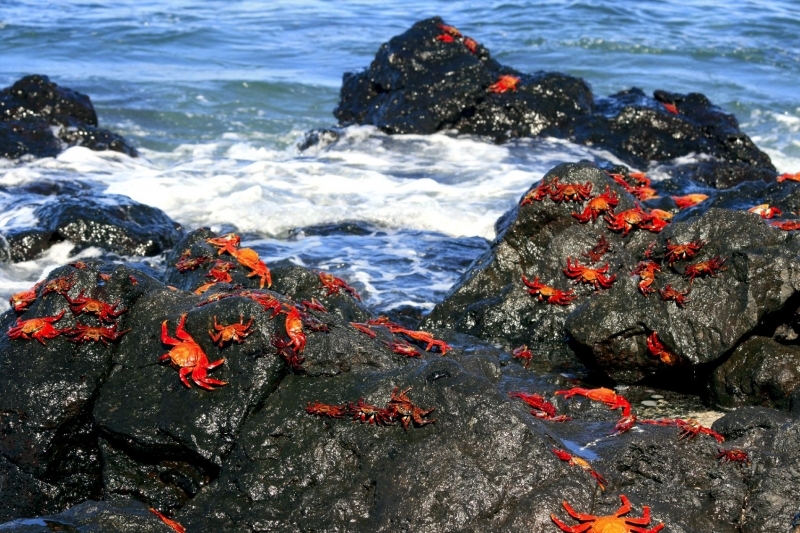 If you walk slowly, they move slowly ahead of you in droves. 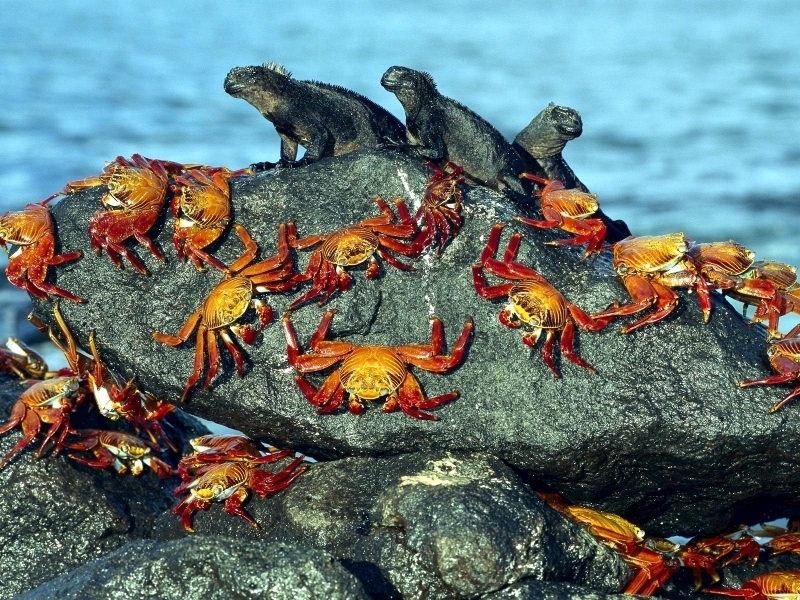 If you hurry, they hurry. 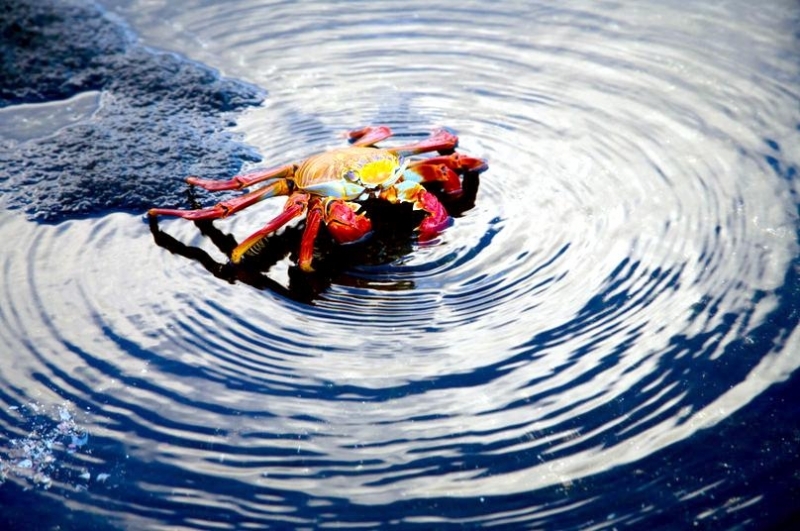 When you plunge at them, they seem to disappear. 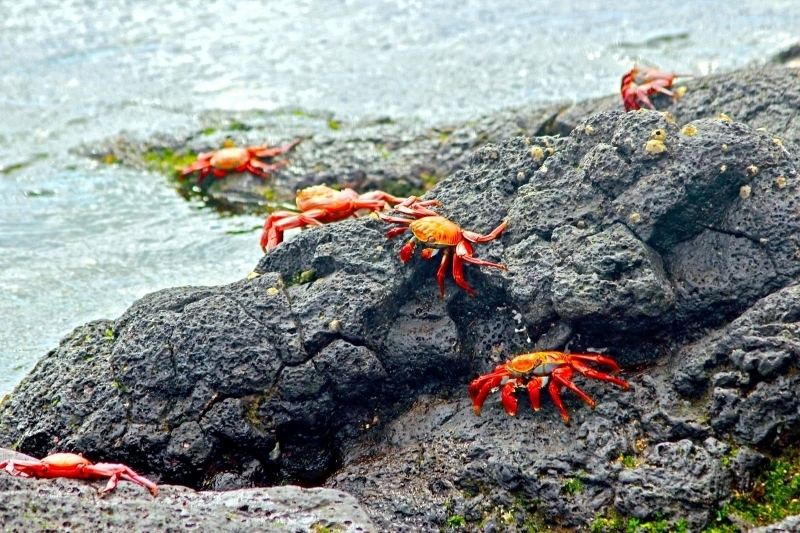 It is impossible to creep up on them. 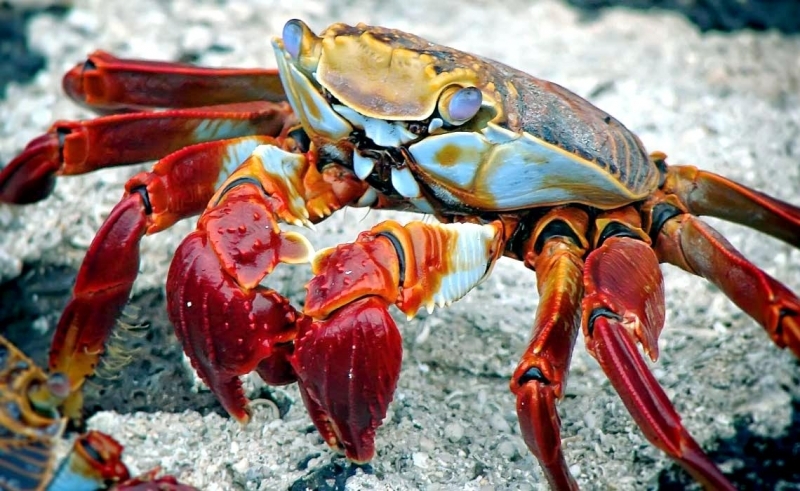 They are very beautiful with clear brilliant colors, red, blues and warm browns. 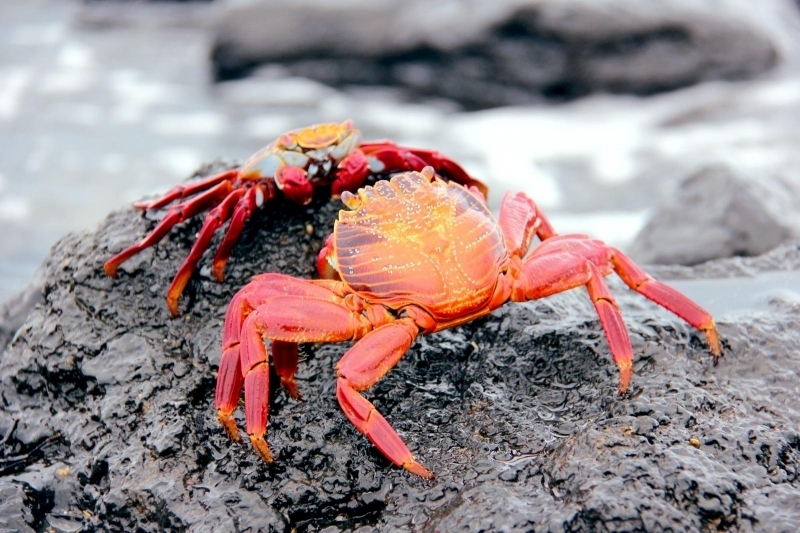 Male Sally Lightfoot Crabs can mate with multiple female Sally Lightfoot Crabs by depositing sperm in the female’s spermthecae while the female carries the eggs underneath her abdomen, caring for the embryos until they hatch as zoea larvae.